Write about the Mona Lisa, and chances are some variation of the word “enigma” will be pulled out of your authorial toolbox. 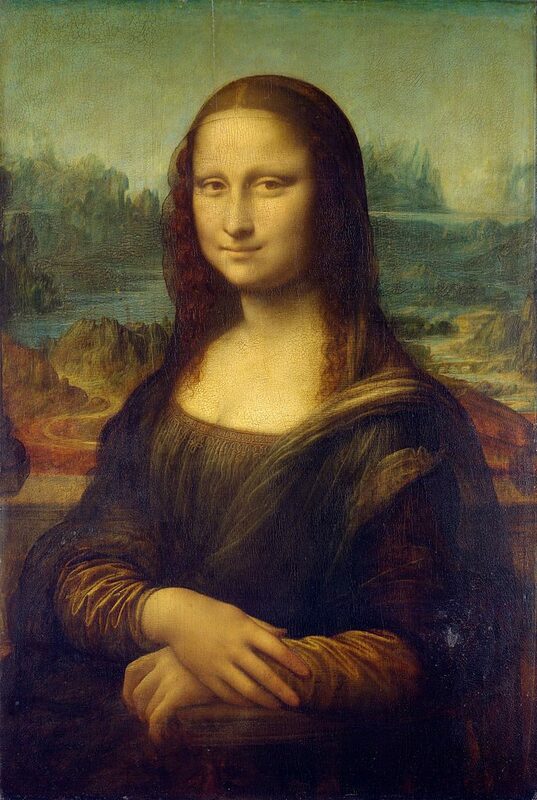 Although Leonardo da Vinci probably didn’t mean to make Lisa del Giocondo (née Gherardini) mysterious when he painted the cloth merchant’s wife in 1503, it has always struck viewers that way, and no doubt that has helped encourage speculation about who the sitter was. The Core Ensemble, a Lake Worth-based chamber-theatrical group that tours the country with shows that provocatively blend plays and music, takes that idea for its new production and runs with it. Equally Divine: The Real Story of the Mona Lisa, which will be seen Saturday and Sunday at St. Andrew’s Episcopal Church in Lake Worth, posits that the actual subject of Leonardo’s painting is a man. Or a man and Lisa. Or a man, Lisa and Leonardo. Parola, joined by pianist Mikael Darmanie, cellist Ju Young Lee and actor Kevin Paley, will present a script written by Jenny Lyn Bader that explores this celebrated image from two vantage points, the first being the theft in 1911 of the painting by Vicenzo Peruggia, who claimed he stole it from the Louvre and returned it to Italy for patriotic reasons. Parola said the painting, as a man, comes to life and interacts with Peruggia. The second track involves discussion of famous men such as Napoleon Bonaparte and King Francois I of France who have “possessed this painting, and obsessed about this painting, in many cases in a sexual way, and isn’t it funny that they’re projecting all this heterosexuality onto a painting that is in fact a painting of a man,” Parola said. The claim about the Mona Lisa was aired about six years ago by an Italian cultural expert who says the model was Salaì, the nickname of Gian Giacomo Caprotto di Oreno, who was Leonardo’s apprentice and might have been his lover. The theory hasn’t gained wide acceptance, but it’s useful for the Core Ensemble’s mission of showcasing diversity, and in this case, gender fluidity. The music for the performance, which lasts about 70 minutes, includes pieces roughly from the period when Peruggia stole the painting, including works by Satie, Poulenc and Darius Milhaud, along with two movements from Stravinsky’s Suite Italienne. Also included are works from the Italian Renaissance by little-known composers including Joan Ambrosio Dalza, and pieces by two living American composers, Marjorie Merryman and Rand Steiger. The Core Ensemble has its origins in a Boston-based new-music trio called Aequalis, which existed from 1985 to 1993 and made a recording in 1990 for the New World label featuring music by Steiger, Chinary Ung, Mario Davidovsky, Miriam Gideon and Martin Brody. But Parola said he wanted to go in a different direction from the world of contemporary music, which at that time was deep in the intramural compositional debate about atonality and audience appeal. After moving to Florida in 1993, Parola got the Core Ensemble started with “genre pieces” that included collaborations with dance companies and a festival at the Duncan Theatre, before it was tightened up into what it is today. “A solo actor, trio on stage, and multiple real characters celebrating diversity became the template,” Parola said. One of the people who was key in helping define that template was the eminent contemporary Argentinian composer Osvaldo Golijov, who told Parola that the model for Core Ensemble was L’Histoire du Soldat, Stravinsky’s chamber music tale of a soldier who meets the devil. “Cut to 2017, and a lot of music from ‘L’Histoire’ is in this show,” Parola said. The Core Ensemble does about 85 shows a year, primarily on college campuses. Its programs include Tres Vidas, an exploration of three Latin American female artists (Mexican painter Frida Kahlo, Salvadoran activist Rufina Amaya and Argentinian painter Alfonsina Storni), and Ain’t I a Woman, an exploration of the female African-American experience that features vignettes from the lives of Sojourner Truth, Clementine Hunter, Zora Neale Hurston and Fanny Lou Hamer. The Core Ensemble tried out an early version of the Mona Lisa show about six or seven years ago with an actress, Parola said, but while the shows went well the ensemble found little market for it. That changed when Parola came up with the Lisa-as-man idea, and it came together for the ensemble when they reflected on the case of Caitlyn Jenner, formerly known as the Olympics champion Bruce Jenner. “But we decided we didn’t want to go too hard with transgender … We wanted to celebrate gay artists with the idea that it has that component to it, within the rubric that it’s a great story, it’s great art and it’s great music,” he said. Bader’s text is often humorous, Parola said, but it also addresses serious issues of bias. “It makes its points about tolerance, and about the suffering that gay artists have gone through because of bigotry,” he said. Equally Divine: The Real Story of the Mona Lisa, will be presented twice, once at 7:30 p.m. Saturday and again at 2 p.m. Sunday at St. Andrew’s Episcopal Church in Lake Worth. Admission is free. For more information, call 561-582-0603.